Fruit dumplings, related to turnovers, are often whole or halved fruit encased in pastry. The pit cavities of the fruit can be filled with dried fruit or sugar, but in this recipe the filling is soft, sweet almond paste blended with the same spices and molasses that make gingerbread so good. Though they look charmingly homespun, the flavor combination is sophisticated enough for a special dinner. The filling may be prepared up to 1 week in advance and stored, airtight, in the refrigerator. The dumplings may be assembled up to 4 hours in advance and stored in the refrigerator before baking. 1Preheat the oven to 375°F and position an oven rack in the lower third. 2 Make the filling: Crumble the almond paste into the medium bowl. Add the molasses, ginger, cinnamon, and cloves. Use your fingers to knead the spices and molasses into the almond paste. If the mixture is too sticky, run your hands under cold water, shake off the excess, and continue—the thin film of water on your hands will prevent the mixture from sticking to your fingers. Once the mixture is well blended, divide it into 8 equal pieces (about 1 ounce each) and roll into balls. 3 Fill the peach halves: Use the serrated tomato peeler to peel the peaches. Cut them in half, remove the pits, and use a small spoon or melon baller to remove the pit marks from the peach, enlarging the cavity slightly. Press a ball of almond paste into each cavity and flatten it level with the cut side of the peach. Spread the excess from the ball of almond paste along the cut surface of the peach. This thin film of almond paste will serve as a barrier to prevent the juices of the peach from soaking the pastry underneath. 4 Assemble the dumplings: Spread 8 of the dough squares out in front of you. Place a peach half, cut side down, in the center of each square. In a small bowl, beat the egg yolk with the milk to create an egg wash. For each dumpling, use a pastry brush to brush a thin film of egg wash along all four edges of the square. Bring the four corners of each square to the center, over the rounded portion of the peach, and pinch the seams together. 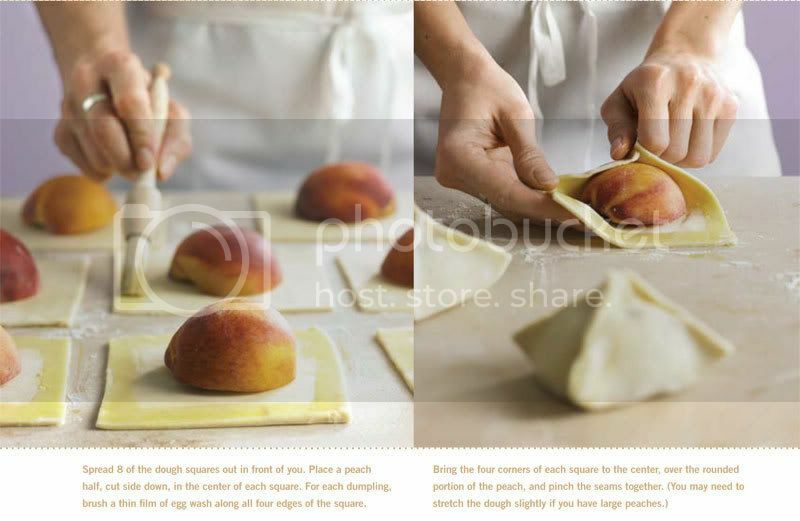 (You may need to stretch the dough slightly if you have large peaches.) Line the baking sheet with parchment paper or a silicone mat and set the dumplings, evenly spaced, on the sheet. Brush each dumpling lightly with egg wash. Use a chef’s knife to cut the remaining square of dough into nine small squares, or use a small round cutter (about the size of a quarter) to cut eight small circles. Place one of the squares or circles at the top of each dumpling, hiding the point where the four corners come together. Brush these with egg wash. Sprinkle the dumplings with the sugar. Chill for 15 minutes. 5 Bake the dumplings: Bake for 15 minutes, then rotate the baking sheet front to back on the rack. Bake for 15 to 18 minutes longer, until the pastry is golden brown and the peaches are tender when pierced through the crust with the tip of a paring knife. Transfer to a rack and let cool slightly. Serve warm dumplings in shallow bowls, each set in a pool of custard sauce, or with a scoop of vanilla ice cream. Storing The dumplings are at their best the same day they are baked. They may be stored overnight in the refrigerator in an airtight container or covered with plastic wrap. Reheat before serving in a 375°F oven for 10 to 15 minutes, until warmed through. Substitute firm, peeled baking apples, such as Granny Smith, for the peaches. and much sweeter than intended. Makes enough dough for 9 turnovers or 8 dumplings, or 1 (9- or 10-inch) pie shell A nearly foolproof alternative to flaky dough, cream cheese dough can be made in the food processor in a couple of minutes. Rich cream cheese takes the place of water and helps to bring the dough together. The high proportion of fat means it’s practically impossible to toughen the pastry. The dough’s tangy flavor and flaky texture accent the fruit fillings in turnovers, though you could also use the dough for pies, either sweet or savory. 1 Place the flour, sugar, and salt in the bowl of the food processor and process for 10 seconds to blend. Add the cold butter pieces and process for 8 to 10 seconds, until the mixture looks like bread crumbs. Add the cream cheese and pulse 30 times (1-second pulses), or until large, shaggy clumps of dough form. 2 Turn the shaggy mass out onto a work surface and knead gently 2 or 3 times to create a cohesive dough. If you are making turnovers or dumplings, flatten into a 7-inch square (about ¾ inch thick) and wrap in plastic. (For a pie, shape the dough into a ¾-inch thick round.) Chill for 30 minutes. Place rolled-out squares between sheets of parchment or wax paper on a baking sheet, wrap in plastic, and refrigerate for up to 2 days. You may also freeze them, layered between sheets of parchment, wrapped in plastic and sealed in a resealable plastic freezer bag or airtight container, for up to 2 months. The dough can be prepared through Step 2 and refrigerated for up to 2 days or slipped inside a resealable plastic freezer bag and frozen for up to 2 months (thaw overnight in the refrigerator before rolling).